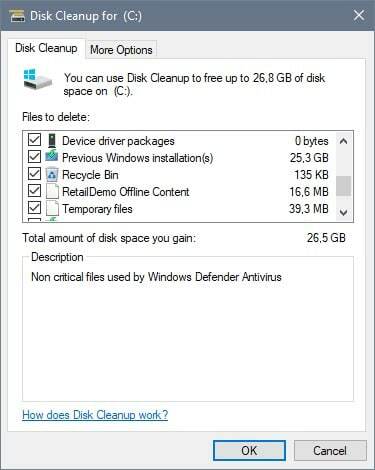 The following tip provides you with information on how to speed up the loading of Disk Cleanup's "clean system files" option on Windows. 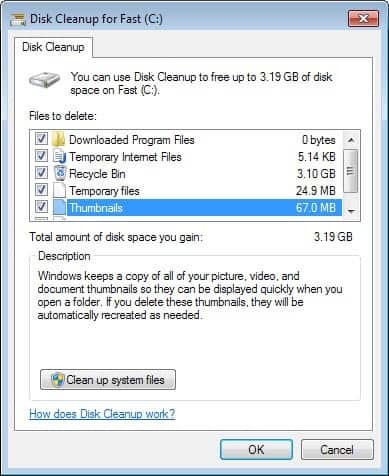 Disk Cleanup is a built-in tool on Windows devices that users may utilize to remove temporary data from the operating system. It is not as complete as dedicated third-party cleaning programs such as CCleaner or Privazer, but it may still remove Gigabytes of disk content that is no longer needed from the system. Only part of what can be cleaned is listed when you run Disk Cleanup on a Windows machine. You can run the program by tapping on the Windows-key, typing Disk Cleanup, and selecting the option. There you find the items listed for cleanup, and a button to clean up system files as well. If you click on that button, the whole process starts over to include system file locations as well. Microsoft improved the process in the Windows 10 Creators Update. The option to select a drive was removed from the process, and the loading of the interface was improved as well. We talked about one option to load the system files interface right away. It required running a command, and while you could create a shortcut for it to improve usability, it was not really liked by many users. There is a different way however to load the system files version of Disk Cleanup right away. All you need to do is hold down the Ctrl-key and the Shift-key before you select the option. So, tap on the Windows-key, type Disk Cleanup, hold down the Shift-key and Ctrl-key, and select the Disk Cleanup result. Windows will take you to the full Disk Cleanup interface right away that includes system files. This works both when you run Disk Cleanup from the start menu, and when you run it from a drive's properties page. You can right-click on any drive and select properties to open the drive's properties. There you find listed an option to run disk cleanup. If you just click on the button, the regular Disk Cleanup interface is loaded. If you want to clean up system files as well, you'd have to click on the button to do so. The tip mentioned above bypasses this and loads the interface right away. Thanks very much Martin for the tip. This tip didn’t work in my Windows 8.1. Just for Windows 10, I suppose. Microsoft improved the process in the —> Windows 10 Creators Update <—. The option to select a drive was removed from the process, and the loading of the interface was improved as well. An even more easier way is to run disk cleanup as administrator (via the right click menu). This also lists system files immediately. Article title is totally misleading. There’s no “Speed up Disk Cleanup System Files loading” in the article at all. The article talks about going directly to advanced “system files” cleaning, not actually speeding up the loading of the “system files” cleaning. Disappointed. Ctrl + Shift + Click opens Disk cleanup with system files loaded on first run as well on LTSB 1607. I assume it does the same on 7 as it does nothing too special, but to run it with administrator priviledges from the beginning. Ctrl+Shift+anything from Start menu simply opens it as administrator which is how it opens directly in system files mode. It is not any special Disk Cleanup-specific shortcut. If you have UAC disabled or set to default level where signed binaries are elevated by default silently (without a UAC prompt), then Ctrl+Shift opening Disk Cleanup shortcut will work to open it directly in system files mode. If UAC is set to the highest slider, you will get a UAC prompt. ” save it as .bat ” ………….how do we do that in Win10 ?? My OS is Win 10 64-bit. I have the latest Windows 10 preview and disk clean up is no different, run it with or without admin right and it still shows me the drive letter choice. ” I replaced notepad by metapad 3.6 “…….can you make batch-files with it ?